Bulbs that are “RF quiet” means your bulbs won’t cause interference with other electronic devices. The “RF” stands for “radio frequency”. Typically, this manifests itself as an odd-but-annoying buzzing or humming on your favorite sound system or problems with the garage door opener. Fluorescents and their ballasts, as well as LEDs, are common culprits. So how do you know if your bulbs could cause issues? The answer is in the specs. Do I Need RF Quiet Bulbs? The most common installation application we’re asked about regarding RF quiet bulbs is garages. If you’ve recently installed an LED bulb in your garage door opener and the garage door clicker no longer triggers the door to open or close, the easiest and most cost effective option is to use that LED bulb elsewhere and replace it with a CFL or rough service incandescent. Rough service incandescent bulbs have a stronger filament to protect it against the vibrations from the motion of the garage door. FCC mark, "Declaration of Conformity"
Listed in the product specifications, especially when it comes to LED lights, is a Federal Trade Commission (FCC) mark or note that mentions FCC part 15 or FCC part 18. The full regulation is FCC Title 47, which states guidelines and approvals of authorization for signal-emitting electronic products by radiation, conduction, or other means. Anything emitting a radio frequency between the range of 9 kHz to 3000 GHz and has the potential to interfere with broadcast radio services falls under its jurisdiction. Part 15 says you don’t need a personal license to operate or own devices and equipment that output radio signals as part of their daily use so long as the intended purpose is not broadcast radio service. Those high powered radio towers and their broadcasters do need licenses to operate their stations. This is good news for you, since you’re not transmitting the Top 40 Songs of All Time from your table lamp to the whole neighborhood. Ranging from lighting and motors to televisions and medical equipment, most electronics using digital logic (i.e. circuit boards for processing), which inherently produces a radio signal, are covered under Part 15. Part 18 ensure your devices or equipment are shielded enough that they won’t interfere with radio communication devices. Many products are listed as FCC Part 15 but not all of them are also Part 18 certified. If you have a lot of signal-emitting equipment and to keep your lights from causing problems, you should check your lighting’s product specifications for “FCC Part 18” before you buy. 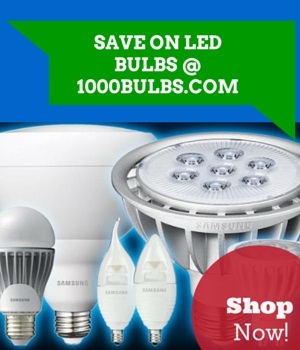 At 1000Bulbs.com, we provide product specifications in PDF format, listing FCC and other important ratings for most of our vast inventory. Choosing Part 18-compliant lighting will eliminate most interference issues. However, it is not a guaranteed solution. For instance, your garage door opener or the amp you use for your jam sessions can be hampered by LED lights in close proximity. Other ways of reducing interference include increasing the distance between conflicting devices, using ferrite beads or chokes on wiring, or even using shielded wiring to keep the frequencies from crossing. If you need more advice on noise interference and how to get rid of it, our team of dedicated experts awaits your call. Contact us at 1-800-624-4488 for your next easy and cost effective lighting solution.